When the Sahabas returned after battle, Nabi SAW informed them that they had returned from the lesser Jihad to the Greater Jihad. This is ofcourse the battle within. This is the Greater battle because it is an enemy that you cant not see and hence can not anticipate when it will strike and failure in this regard could mean eternal damnation in hell, indeed a mighty price to pay for failure. InshAllah for the next few weeks I will try to explain the battleground and what we should be doing to be on the winning team. Mujahida is the term used for any mental, physical, or financial hardship that one may have to bear for the sake of Islam, and the above verse is a poignant one for such people who strive in the path of Allah. Mujahida can indeed be very personal, in the case of fighting one’s base desires (nafs) and subjugating it to the rule of Islamic Sacred Law (shariah). 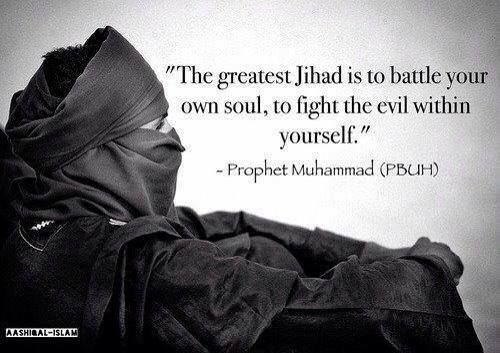 The Messenger of Allah said that a mujahid is someone who struggles against his nafs for the sake of obeying Allah. The nafs always wants to lead mankind astray because it revels in acts that are against the shariah. Hence, a person becomes deserving of reward from Allah if he controls the unlawful desires of his nafs and subjugates it to the commandments of Allah. Allah had blessed a student of a Sheikh with a successful business and hence a great deal of wealth. This student wrote his teacher a letter explaining that he felt hesitant to pay zakat (alms) when it was due, due to fears of financial loss and hardship. He would of course pay the correct amount due every year but amid apprehension of losing his wealth. The Sheikh replied back that he would earn twice the reward of people who merely pay their zakat without a thought, for he was not only fulfilling the command of Allah, but also struggling with his nafs over the issue. Man will earn reward every time he struggles against his nafs or other circumstances to fulfill the Will of Allah. The nafs will always work hard to tempt man to act against the shariah; to fulfill unlawful desires. Shaitan in turn gives added strength to the nafs by tempting man from the outside, and hence together these two forces join in an ongoing effort to lead people astray. Man should stand determined against these forces and committed to obeying Allah. When he struggles against this onslaught it will be known as his personal struggle because he is fighting in the Path of Allah and will earn reward accordingly. Allah rewards each and every action because He says in the Holy Quran that He will not let any action go to waste. Man is an ingrate who enjoys the countless blessings of Allah without realizing their tremendous value or thanking Allah for them. Allah on the other hand places great value on every righteous deed and does not let anything go to waste. Man needs to realize the infinite bounties of his Creator that he takes for granted and he should return to worshipping his Lord instead of falling into the trap of worshipping his nafs. If man remains asleep at the time of Fajr then he abandons the command of Allah and becomes a worshipper of his nafs because his bed is dearer to him at that time. Likewise if he ignores the time of prayer like most of us do in gatherings like weddings then he has again abandoned the worship of Allah and given in to his nafs. Everything that takes away from the worship of Allah falls into the worship of the nafs, and man needs to fight against this so that he can again return to obeying Allah. All the false gods that man worships cannot even create a fly if they unite together, and moreover cannot take back something that the fly might steal from them. Idols and the nafs are all such false gods, whereas the One to be sought is something beyond these illusions and fabrications. The Holy Quran continues in stark candor that man does not realize the true worth of his Creator. Allah says in the Holy Quran that the best trade is to declare faith in Allah and His Messenger, followed by struggling in His Path with life and wealth. Allah has already clarified that He will take note of and reward the minutest of deeds, but this too man is not prepared to do. Allah will help and ease all affairs if only man worships Him as meant to, but man falls into the fatal delusion and thinking that he only need worship after Allah helps him. Man has been told that the whole world is at his disposal if only he accepts Allah as his sole Sustainer. Hence man need only to worship Allah and all matters will resolve themselves by His Mercy. Sadly, man reverses this paradigm and starts worshipping his nafs and the false attractions of this life before Allah. Man will never progress in this journey if he insists on this foolish course of action of putting the cart before the horse. 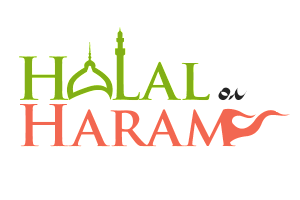 Allah says in the Holy Quran that He will straighten out all man’s affairs but man has to obey. Obedience to Allah will open all doors and man will be honored and guided. The Holy Quran states that honor is for Allah, His Messenger, and the believers. Allah bestows honor through wealth and also through righteous deeds: the honor begotten through wealth is finite and fated to die with this world, but that begotten through righteous deeds is eternal. Allah will honor whom He will with and dishonor whom He will because He is the Master of all creation. Whoever relies on the honor that earthly wealth brings will surely be the loser in this life and the Hereafter. Allah bestows everlasting honor through the blessings of working and struggling for the sake of the religion. The Prophet said that Allah starts loving the person who works and suffers for the sake of Islam, and hence He summons Hadrat Jibril and says that He loves that particular person. Hadrat Jibril then announces in the heavens that Allah loves a certain individual and thence all creation in the heavens starts loving that same person because Allah loves him. Hadrat Jibril then descends to Earth and makes the same announcement, and it so happens that all earthly creation starts loving this person in the same way. Allah showers such chosen people with His Blessings so that others are automatically attracted to them and fall in love with them. Allah says that He will subjugate creation in front of the one who subjugates to Him, and hence these special lovers of Allah are raised to such a high plane that hearts of other people automatically overflow with love and admiration for them. We may not have seen our pious leaders of old or sat in their blessed company but we love them even more than our parents. A Muslim may tolerate an insult to his father but he will definitely not tolerate any such insult against Hadrat Abu Bakr as-Siddique, because the love he has in his breast for these people will not let him sit still. These are special people who have a special status with Allah because they have worked hard for the cause of Islam and against their own nafs. Allah has honored them because of their righteous deeds and hard work. Nafs is man’s enemy and must be trained so it is brought towards righteousness. Mujahida of the lovers of Allah today and through the ages has been to train this nafs so that it becomes an ally in serving Allah rather than an enemy. There are three stages or types of nafs. Nafs ul Ammara is the worst category of nafs, in which a person not only commits sin but boasts of his sins and thus challenges Allah. This is an animalistic nafs that does not care about anything or anyone, least about pleasing Allah. This nafs is a close ally of Shaitan in pushing people away from Allah and Muslims should pray for deliverance from this type of evil. Nafs ul Luwwama is a stage somewhat improved from this such that this type of nafs feels shame when it commits sins and repents to Allah. This describes the average Muslim who desperately wants to obey and please Allah but slips into sin because his nafs overpowers him at times. However, after falling into sin he immediately repents because he feels deeply ashamed. Although this nafs is definitely an improvement from the previous one, man should always keep striving to improve his nafs beyond this. Nafs ul Mutma’inna is the best kind of nafs. It has been rectified and trained to obey Allah. Only the special lovers of Allah who have struggled their whole lives against their nafs are so blessed. This type of nafs now remains preoccupied with the sunnah and other ways by which to please Allah. Moreover, people with this type of nafs not only run from sin but Allah protects them from sin and keeps them on the path of the shariah. This nafs struggles so hard to improve itself that Allah will admit it into Paradise on the Day of Judgment as He promises in the Holy Quran. This is the nafs that man should beg for and beseech from Allah. All sacrifice that man makes for the sake of religion, whether it be time, money, or deeds comes under the definition of mujahida. However small the sacrifice may seem, Allah has promised in the Holy Quran that He will not let any sacrifice go to waste. Ever since Shaitan was exiled from Paradise, mujahida has been written in man’s destiny since Shaitan promised to lead man astray at every opportunity. Allied with Shaitan within man is his nafs, constantly urging him to act against Allah’s wishes and toward the fulfillment of evil base desires. Trapped alongside the nafs within the body is the ruh (spirit), which is inherently pure and constantly struggles to act according to Allah’s wishes. Hence man is destined to struggle between good and evil until he triumphs over his nafs by the mercy of Allah. Man is weak and cannot do anything alone; hence Muslims should constantly pray to Allah for help in making their nafs submit to His Will.